This book was written by a guy going by the pen name of Nasdijj. It was actually marketed as a memoir and apparently really wasn’t. However, if one reads the book as though it were fiction, it’s a compelling read. The author likes to string together similes and metaphors, but in spite of the fact that I agree with this article’s author about such writing (see in particular the Blood Meridian description), these strings did manage to provoke some very vibrant imagery in my head. The book itself is about a half Indian (Native American to either be PC and/or to avoid confusion) who’s had a very different life than I. He was born with Fetal Alcohol Syndrome and as such has a very hard time reading and writing, he adopts a son who dies from the same condition, he went through childhood as part of a migrant family, he’s been homeless, he tells of life on the reservation, and gives a glimpse of what life might be like for those who leave the reservation. It brings some awareness to the lost history that is generally not taught in public school, and the oppression and loss suffered by the Indians. I obviously do not know the truth (or potential truth) behind the stories in this book, but in my opinion, if this book can enlighten folks who don’t know any better (like me), then it is worth the read despite the falsehood in marketing. I’d guess the main issue in this case would be that “Nasdijj” made money this way, though not from me, as my copy was an ARC I picked up at a bookstore back in 2000! And another Off the Shelf book review! After hearing a bunch of stuff about N. K. Jemisin’s new series, Dreamblood (a two book series coming out in May and June 2012), I thought I’d better catch up and read the already finished trilogy! It also helped that I could up my OtS count. 😉 Ah something to help me choose what to read next! Yeine Darr is an outcast from the barbarian north. But when her mother dies under mysterious circumstances, she is summoned to the majestic city of Sky. There, to her shock, Yeine is named an heiress to the king. But the throne of the Hundred Thousand Kingdoms is not easily won, and Yeine is thrust into a vicious power struggle with a pair of cousins she never knew she had. As she fights for her life, she draws ever closer to the secrets of her mother’s death and her family’s bloody history. With the fate of the world hanging in the balance, Yeine will learn how perilous it can be when love and hate – and gods and mortals – are bound inseparably together. This book is traditional fantasy and yet… not. The story starts out as you’d expect, the barbarian girl goes off to the ruling city as she’s summoned by her maternal grandfather who is the ruler of the world, but once she gets there things go crazy. There’s politics, glimpses of (not even remotely) a hundred thousand cultures, gods, bits of magic, religion, slavery, opulence, death, treachery, and surprise twists. I loved how this story ended and can’t wait to read the next one in the series (and fortunately I don’t have to)! I love how the world is so big, and yet we aren’t overly burdened with descriptions (in spite of the fact that I’m one of those people that love the descriptions). The pace was terrific, and I couldn’t stop reading once I got to the last third of the book, which doesn’t happen to me often at all. On that note, I’ve been very fortunate in my reading lately, which I hope to post about soon! in future blogs. Please, if you haven’t read this book yet, and are wondering about the hype you’ve likely heard, just go read. I doubt you’ll regret it! Tor.com ran a series of 5 short stories based on a piece of art by John Jude Palencar in March, and this one in particular was written by L. E. Modesitt, Jr. whose Imager Portfolio novels I’ve been reading most recently. “New World Blues” takes the picture in a completely different direction than I’d expected, and in so few words manages to imply a whole huge background of a universe as well as to empower a character. It’s a quick, inspiring read, and I recommend it. Read here for the story behind the collection, and go here to purchase an ebook of the 5 stories. That “there are too many mysteries presented that allude to some greater meaning-to-be-explained that are never resolved and don’t actually mean anything”, that it “tried too hard to evoke Orwell’s 1984“, that “Allison Hiroto’s narrative was terrible”, and that the book had a “far-fetched love story axis”. As our protagonists’, Aomame’s and Tengo’s, narratives converge over the course of a single year (1984 in Tokyo), we learn of the profound and tangled connections that bind them ever closer: a beautiful, dyslexic teenage girl with a unique vision; a mysterious religious cult that instigated a shoot-out with the metropolitan police; a reclusive, wealthy dowager who runs a shelter for abused women; a hideously ugly private investigator; a mild-mannered yet ruthlessly efficient bodyguard; and a peculiarly insistent television-fee collector. A love story, a mystery, a fantasy, a novel of self-discovery, a dystopia to rival George Orwell’s, 1Q84 is Haruki Murakami’s most ambitious undertaking yet: an instant best seller in his native Japan, and a tremendous feat of imagination from one of our most revered contemporary writers. To start, I have to agree with one of the reviewer’s comments that the book was a bit overbloated. Particularly in the third book when a third main POV character was added. At this point when the character’s fates are converging, we start getting the same events happening from three points of view, which was somewhat interesting, but still very much a bit much when it came to the story. As to the comment about it trying to evoke 1984, I’m not sure I agree, though it’s entirely possible I’ve just forgotten too much about 1984 to see where the reviewer is coming from. I would agree that it tried to bring forth themes that nothing anyone did was truly private. In this story, it wasn’t the government watching, but some other entity. And the irony of the fact that, in spite of this near complete lack of privacy, it was still entirely possible to be and feel completely alone and lonely. Allison Hiroto’s narrative could be fairly bland, I’ll admit that. However, to me her delivery felt completely perfect for the primary character she was portraying. Aomame has essentially cut most emotions out of her life, and nearer the end, she turned dreamy and hopeful in my mind’s eye. I feel Ms. Hiroto presented the Dowager and Aomame’s friend on the police force well also. As to the unfinished threads and far-fetched love story angle, I got the impression these two reviewers weren’t reading the book I did. I’ll admit the more supernatural aspects of the book remained unexplained at the end, but for me that made sense (which is saying something, as I tend to prefer to have the author explain things as well). 1Q84 WAS a love story. All the rest was just means to that end and never needed to be explained. All that being said, I fully enjoyed this audiobook (which was a long one! ), and would strongly recommend it. In addition, the audiobook includes interviews with the two translators at the end, during which I learned that Murakami is a translator himself, and briefly wondered why he wouldn’t have translated his own works into English, knowing exactly what he meant with the writing (unless it was just because it might take more time than he wanted to commit). The interviews led to some insights for me into Tengo’s character as well. This novel was definitely a bit of a filler novel for me as far as plot goes, however the growth of Takeo and Kaede in particular dominate this novel. Both go through a bit of finding themselves as well as each other. The novel definitely sets up the trials these two will face in the next novels. The readers are the same and have the same wonderful characterizations as well as the same flaw as mentioned previously. And while I’m talking of Carrie Vaughn, I’d better get around to writing about Kitty’s Greatest Hits which I listened to recently. Again narrated by Marguerite Gavin, who’s awesome (if a tiny bit mealy-mouthed sometimes), this one was great fun to listen to. This is apparently most of the Kitty universe short stories published between 2003 and 2010, plus You’re on the Air” (about a vampire gas station attendant finding his dead self) and the novella “Long Time Waiting”. While there are a few Kitty stories collected in this book, for me the more memorable ones focus on some of our (or at least my!) favorite “side” characters or historical figures from said universe. Rick and especially Cormac are featured characters with two stories apiece (that I remember for sure). The novella mentioned above is Cormac’s side of things from when he was in jail, and explains the presence of Amelia. I’d love to hear another story from Cormac’s POV about Amelia now that Cormac’s out of jail! “God’s Creatures” where we get to see what Cormac is up to when he’s not in the Kitty books. “Wild Ride” was T.J.’s origin, revealed. “The Book of Daniel” is a retelling of the story of Daniel in the lion’s den. “Conquistador de la Noche” is the origin story of Rick the vampire! Where did he come from, and did he really know Coronado? “The Temptation of Robin Green” (if I have this one right) includes a young researcher who finds more than she bargained for in the paranormal and includes an appearance by Rick. “Il Est Ne” in which Kitty spends a Christmas alone and meets another rogue wolf. “Life is the Teacher”, a story in which we check up on Emma, from Kitty Goes to Washington. “Kitty’s Zombie New Year” when a new year’s party goes a bit wrong for Kitty. “A Princess of Spain” where Catherine of Aragon finds danger and intrigue in the court of Henry VII. “Looking After Family” in which a sixteen year old Cormac hunts his first werewolf. “Winnowing the Herd” a Kitty story, takes place before the first novel: It’s the staff appreciation party at KNOB. “Kitty and the Mosh Pit of the Damned” when Kitty shows up to interview a band that’s got some supernatural power over their audience. In any case, I really enjoyed these stories and strongly recommend them to anyone who’s caught up with the Kitty series! Like steampunk? Like short stories fraught with adventure, impending war, alien artifacts, and forbidden love? Then try Carrie Vaughn’s “Harry and Marlowe and the Talisman of the Cult of Egil” as published in Orbit Books’ online magazine, Lightspeed. I have to say, after reading this story, I’d love to read further adventures of Harry and Marlow! While easily a nice, complete story, there were hints of tons of potential stories and drama in these ~6657 words! 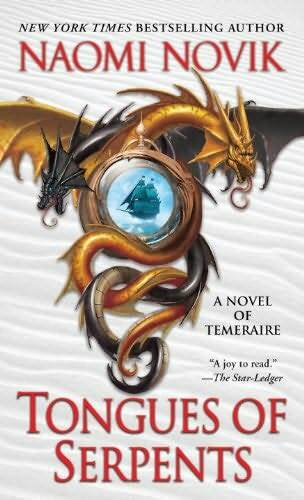 Tongues of Serpents, by Naomi Novik, is the 6th book in her Temeraire series. In this book Laurence and Temeraire have been transported to Australia as a consequence of actions in the previous novels. There they encounter politics, aborigines, Chinese, smugglers, new dragon breeds, mythical creatures (besides dragons, of course), long flying, lots and lots of desert, and maybe even a place to settle down and call home? This book dishes the news that the world has frankly gone to hell in a hand basket, and hints that many of the problems are a direct result of actions taken by our favorite duo. Here’s to hoping their actions can bring things back around in the future! In any case, I enjoyed the book, breezed through it, and have moved onto the recently released book 7, Crucible of Gold, where Laurence and Temeraire are thrown back into the fray. Sixteen-year-old Takeo’s village has been massacred by an evil warlord, and he is about to be slain by the men who murdered his parents and neighbors. At the last moment, his life is saved by a nobleman, who claims the boy as his kin and begins his education. But nothing is as it seems. Takeo discovers that he has rare powers that are useful to those around him. As he grows into manhood, he must decide where his loyalties lie: with his noble master and adoptive father; with the Hidden, a secret, spiritual sect whose beliefs are forbidden; or with the Tribe, the assassins and spies who consider him one of their own. The novel was exciting, giving one a tiny glimpse into what life must have been like in feudal Japan. The story was full of love won and lost, lives lived and lost, secrets, magic, and war. I have high hopes for the next book(s), as Takeo (and company)’s story has only just begun!